In a large mixing bowl, beat the egg whites until soft peaks form. Fold in the desiccated coconut, chilli, salt, and pepper. Divide the fluffed egg whites into 3 dollops over a baking sheet lined with parchment paper. Make a small dent in the centre of each. Bake at 230C/450F for 3 minutes. 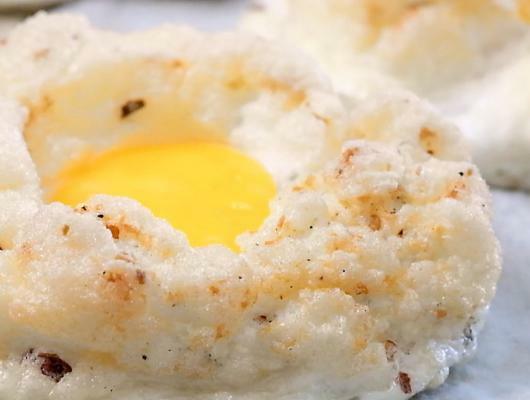 Take out of the oven and put the yolks in the centre of each egg cloud. Finish baking for another 2-3 minutes. This recipe is not your regular egg dish. These chilli-coconut egg clouds are a little bit of heaven, with a little bit of heat thrown in for your sinful side. The fluffy egg whites are mixed with the spicy chilli flakes and the desiccated coconuts to provide the perfect balance of flavours to please all of your different personalities. The chilli flakes are perfect for raising your metabolism and making you feel fuller for longer. The desiccated coconut is simply dehydrated coconut meat that has been shredded. This coconut contains nutrients like manganese and copper and is a good source of dietary fibre. It also has no cholesterol. Add in the eggs and you have a good source of protein, vitamin B2 and vitamin D. With just a few ingredients and a little skill you can start your day off firmly on the right foot with your head in the clouds.